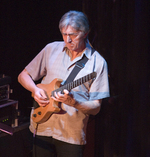 Allan Holdsworth Trio 2007 East Coast tour dates!!! With Chad Wackerman - drums, and Jimmy Johnson - bass. The following dates have been posted on Chad Wackerman's website. 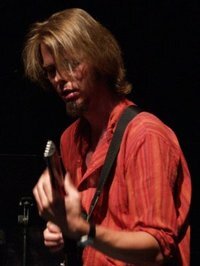 Greg Howe is going to kick off the 2007 NAMM week bash with a show at Tone Merchants in Orange, CA on Jan 18th 2007. Seats are $20.00 per person; advance reservations are required. 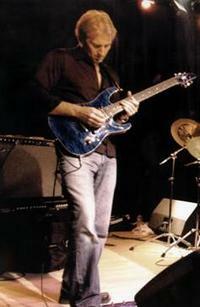 Guitarist Alex Machacek is one of the great new voices in jazz fusion. His latest album [SIC] is really making waves for it's originality, and the stunning performances of the musicians involved (one of whom is legendary drummer Terry Bozzio). I had a chance to interview Alex recently, and found him to be a very gracious guy who was more than happy to answer my questions. The Guitar Channel: Your latest album, [SIC], is one of the freshest-sounding jazz fusion albums I've heard in a long time. The liner notes state it was recorded in Vienna, Austin, and Los Angeles. How long did it take to put the whole album together? Was it something you recorded bit by bit over time? Alex Machacek: Well, thank you for your compliment! This album took me a long time – all in all about 5 years. But I didn’t continuously work on it, I worked on some tunes but got distracted by other projects. I started when I still lived in Vienna, recorded bits and pieces there, I used some “drum – leftovers” of Terry from the BPM “Delete and Roll” recording session which were recorded in Austin and I finally finished the album after I moved to Los Angeles. GC: What prompted you to re-record "Austin Powers" for [SIC]? The version that appears on the BPM Delete and Roll album is really cool, though it lacks a guitar solo. Did that have something to do with it? AM: This version was originally planned for a Shawn Lane tribute record that Mike Rewa wanted to release. But I haven’t heard anything about a release yet so I thought let’s put it on my album. Besides the fact that there is no guitar solo on the version of Delete and Roll there are many other different things going on on the new version, I recorded all these ambient guitars during the solo, I scatted the theme, overdubbed acoustic guitar and so on. And one of the main differences is the rhythm section – drums partially played with brushes and upright bass. I thought it might be interesting to hear the same song in a different setting. GC: The guitar tones and overall production on the new album are fantastic. What gear did you use? Guitars, amps, effects, etc. AM: The guitar is the cheap Korean Steinberger “broom” but with other pickups. On the amp side I used a Boogie Caliber50 and a Rectoverb – sometimes I recorded just with a DI box. I mostly recorded dry and added some delay/reverb while mixing. Except for some ambient guitar layers, there I used the Rocktron XPression, the green Line 6 and probably some other stuff, which I can’t remember now. Joerg Mayer and I mixed the whole album on my PowerBook – using Logic and Waves plug ins. I downloaded the demo version of the Waves (since I can’t afford the bundle I would like to have) which works for 14 days – so we were definitely under pressure finishing the mixing process in time!!! GC: How did you get involved with your current label, Abstract Logix Records? AM: Souvik Dutta contacted me years ago, when I was still living in Austria because Shawn Lane told him about me. Souvik started distributing my CDs in the US and when I told him about my plans for a new CD he asked me if I would be interested to release it on his label. GC: I've read that you attended the Conservatory of Vienna, and also Berklee in Boston. Was there a point during your schooling where you felt your own style begin to emerge, both as a guitarist and as a composer? GC: How did you develop your vocabulary for improvisation? Was it mostly concepts you learned at school, or did you learn a lot from transcribing other players as well? AM: Probably a mix of both. I had some good teachers and I did a fair amount of transcribing. But I also came up with my own “concepts” or “solutions”. GC: Has working with drummer Terry Bozzio had an influence on your playing or writing? AM: Definitely yes! Terry is such a unique drummer – he has all these different sounds and some of them are very unorthodox, like for instance his chromatic piccolo toms. He can actually play melodies with me in unison. So whenever I write something for him I try to come up with something that fits his style and his sounds. Sometimes I do achieve this goal. GC: I've read that Frank Zappa and Allan Holdsworth have been big influences on you. How exactly did they impact your playing and writing? AM: Holdsworth just blew me away with his choice of notes and his chords. I tried to figure out what he is doing by transcribing and learning some of his solos. I really like that his lines are kind of unpredictable but still just awesome melodies. And for me Zappa was the counterpart – the rhythmical challenge of his composition, his way of orchestrating/arranging. I tried to combine these two approaches on my first album “Featuring Ourselves” (which is out of print). GC: Any chance "Featuring Ourselves" will be re-released? AM: I won’t re-manufacture it but I am considering to put it up on the Abstract Logix download site. Right now I am in the process of dealing with the legal issues (not all compositions on this album are mine). As soon as the clearance is done I will put it up as a digital download. GC: Are there any other guitarists around today that you admire? AM: There are a lot, but Ben Monder should be mentioned first – he is so unique and deserves much more attention. AM: Hugh mastered one track of mine for the Shawn Lane tribute album that never came out (at least until now). When I moved to LA I got in touch with him, we became friends. Hugh helped me with my website and was overall very supportive to me. He asked me if I wanted to play a guest solo on his CD and I gladly did it. GC: So what's next? Any new projects or live dates coming up? AM: Live: on Nov. 8th and Dec 13th, 2006 I’ll play with Marco Minnemann, JK Kleutgens and Antti Kotikoski at the Baked Potato. In January 2007 I’ll be in Japan with Terry Bozzio and Doug Lunn. Also I want to make a CD where I use the “compose” around concept and apply it to different drummers. So far I have material from Terry, Marco Minnemann, Mario Lackner, but I already asked a couple of other well known drummers and they will give me some material as well. Many thanks to Souvik Dutta of Abstract Logix, and of course to Alex for taking time out from his busy schedule to chat with me. Visit Alex online at http://www.alexmachacek.com. The Guitar Channel radio stream can now support up to 15 listeners at once (up from 12). Enjoy! 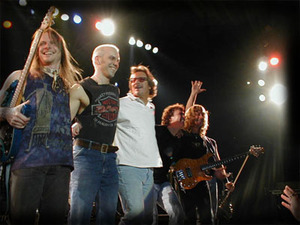 Steve Morse Band / Dixie Dregs 2007 tour dates! Apparently, more dates will be announced soon. 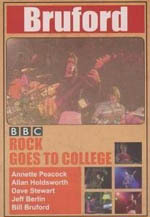 All About Jazz has posted a review of the recently released DVD of Bruford's 1979 performance on Rock Goes To College. This is a classic show from a classic band that featured Allan Holdsworth on guitar, Jeff Berlin on bass, Dave Stewart on keys, Annette Peacock on vocals, and of course Bill Bruford on drums. 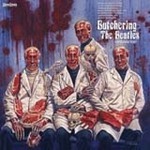 On October 24, 2006 Restless Records will release "Butchering The Beatles". This looks to be the heaviest tribute to the Beatles ever recorded. Check out the track listing below and the players involved. Personally, I'm looking forward to hearing "Taxman" with Steve Lukather and Tony Levin. Brett Garsed has posted a new lesson on his website. It's the fourth in a series he is doing for Australian Guitar Magazine. The new lesson is called Scales and Arpeggio's, and has transcriptions and MP3's of all the examples. There's some really nice lines in this lesson too; lots of great hybrid-picking stuff. Definitely check it out. UPDATE 11/3/06: This album has been released. Read my review here.